Pune (Chinchwad), 11th August 2017: The Don Bosco Development Society (DBDS) Chinchwad, organized a “Legal Awareness and Literacy Session” for the women residing in Ajantha Nagar slum in Chinchwad. 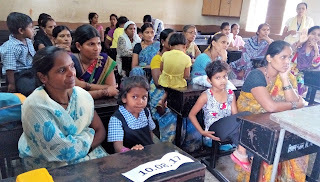 25 women participated in the program held in Mata Ramabai Ambedkar School. The workshop was part of ‘Women Empowerment Project’ supported by AXA Business Service, Pune. Advocate Pretti Sathe was the resource person; in her session she covered issues leading to divorce, domestic violence, dowry and sexual harassment etc. She shared knowledge of legal provisions and processes and encouraged ladies to use this knowledge to realize rights and entitlements and demand justice, accountability and effective remedies. She explained in details about women’s Property rights, Marriage and personal laws, divorce and their provision under law, maintenance, domestic violence, inheritance law, Hindu Marriage Act, etc. Mrs Vibhawari Kamble (Field Staff - DBDS) organized women in this slum to participate in this programme. Commenting on the event she said, “Literacy on legal matters and pro- activeness will help empower women to build a more equitable society.” She thanked advocate Sathe for guiding women on legal matters. Participants also actively discussed their problems and were guided accordingly by the resource person.